The Champtek barcode slot reader can be used with a variety of mobile systems wherever barcodes are read and the aspect of mobility is crucial. 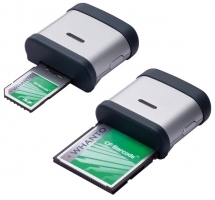 You can acquire our scanner either for the insertion in CompactFlash or SDRAM slots your clients will benefit from a wide range of options with regard to its mobile applications, for example in the areas of logistics, commerce, office, laboratory, etc. Symbol laser engine 100 scans/sec. The integrated Symbol laser scan engine reads all of the current bar codes at a distance of 3 to 15 cm. With 100 scans/sec. this reader is highly accurate, effortlessly recognizing soiled or low print pressure bar codes. To initiate the scan process, please press the microswitch at the side of the reader. The module automatically decodes all of the current bar codes, transferring the data to the PDA, as if entered via keyboard or touchscreen. Thus, the bar code information will directly show on the sensor position therefore, an adjustment of the software to the system is unnecessary. The initial operation of the reader is a question of a few seconds the driver included is simply installed into the PDA via data synchronisation. You can buy your Champtek bar code scanner in two different versions either for CF or for SD-slots. The reader is ideal for the mobile use in the PDA or mobile terminal, not least due to its low weight of only 40 g and the compact measurement of 80x49x19 mm. Three of the most common types of system software Windows CE, Pochet PC 2002/2003 and Palm OS 5.x support the driver included. Its minimal power consumption of merely 75 mA guarantees its long-lived activity with regard to every terminal without considerably influencing the battery life.